Approved in 2017 with bipartisan majorities in both houses – and adjusted in 2018 because of a problem with property taxes – lawmakers and Gov. 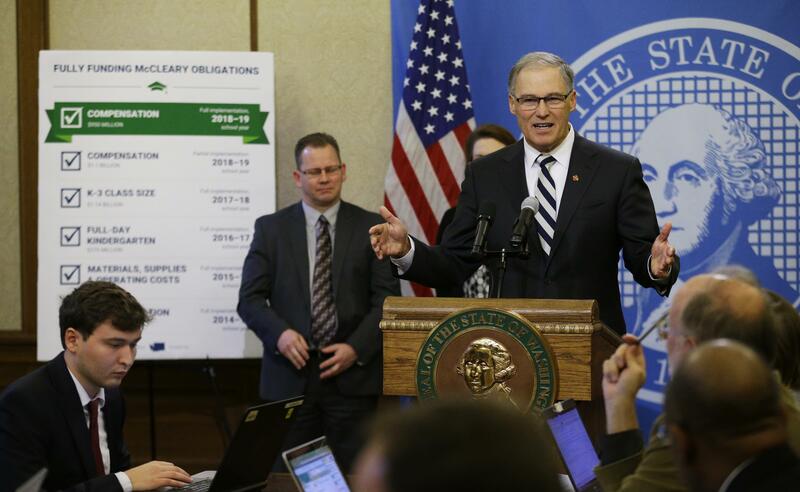 Jay Inslee hailed it as landmark legislation that assured Washington was finally paying its fair share for the basic education of its children, from kindergarten through high school. But there are things about public schools the McCleary fix didn’t fix. Changes it made have school officials facing millions of dollars in unexpected costs that could mean a choice between cutting programs or asking for higher taxes. They’re seeking help from the Legislature, but lawmakers already face a new bill the state must shoulder, some $900 million over the next two years to cover the health insurance and other benefits for school employees throughout Washington who provide what the state considers basic education. For the school districts, the benefits contract that the state negotiated without them only multiplies their problems. Basic education, as defined by state law, is not everything a school district offers. Special education, although mandated, isn’t part of basic education, and neither are some programs like band, sports or early childhood education. The state doesn’t pay the salaries of employees a school district hires to provide those programs; some money comes from federal sources the districts say are inadequate, or what the district collects through its local property tax levy. The state has a “prototypical model” for what it will cover for certain services outside the classroom, like the number of school nurses, counselors, school safety officers or librarians. A district can hire more, but must pay their salaries out of its own funds, which come from property taxes. On top of those salaries for employees not covered under the model for basic education, districts also face a change in 2020 on the cost of health care. The state has negotiated a new School Employees Benefit package for all public school workers, whether they are basic education staff paid by the state or other staff paid by the school district. Patterned after the Public Employees Benefit plan for state workers, it includes health insurance that is more expensive than many districts currently provide. The contract the state negotiated also has a different calculation than many districts use for determining when a part-time employee is eligible for full-time benefits. For many districts, part-time employees currently receive a prorated contribution to their premiums based on the percentage of their hours compared to a full-time schedule. Under the School Employees Plan, a person who works 630 hours, which is less than half of a school year, would be eligible for full-time benefits. Having the state create the School Employees Benefits plan was “a huge part” of the compromise that allowed the Legislature to pass laws that satisfied the Supreme Court mandate, said House Appropriations Chairman Timm Ormsby, D-Spokane. By some estimates, the total cost to all districts for the new benefits package could top $100 million over the next two years for school employees who aren’t classified as basic education. For the Spokane Public School District, the estimate is about $1 million. At Central Valley School District, it’s $2.35 million. At Mead School District, it’s $1.6 million, although “the rules keep kind of changing as we go along, so it’s hard to get a good estimate,” Assistant Superintendent Wayne Leonard said. As part of the McCleary fix, the state rearranged the property tax system which was helping to create inequities among school districts across the state. Districts that had high property values could get relatively large amounts of new money for programs and personnel, with relatively small increases in the levy rate. Districts with low property values needed to raise their levy rates much higher to get a fraction of that money. Spokane Public Schools officials say raising their levy a nickel for every $1,000 of assessed valuation in their district would bring in $995,000. A nickel raise for the Seattle School District would generate $11 million, but for the Cheney School District just $195,000. When the state reduced its funding for public schools during the recession, many districts raised their local levies to make up the difference or add new programs. Others tried to raise levy rates, but couldn’t convince voters. Over time, that helped create the inequity among the districts, and the students they served, cited by the Supreme Court. To solve that inequity, the Legislature raised the statewide property tax levy to pay the costs of basic education, and required the districts to drop theirs. Local levies were capped, and the money they raise could only be spent for salaries and programs outside basic education. For some districts that meant the total they received from state and local property taxes was more, for others less, and for others about the same. The McCleary fix was sold, in part, as a way to provide equity both to students and to taxpayers. With a benefits package that for many districts would be more generous and more expensive than what is currently offered, there’s also talk now of equity for school employees. Experts question whether achieving equity for all three is possible. Senate Majority Leader Andy Billig, D-Spokane, said the better employee package – which is comparable to what legislators have – helps equalize benefits for school employees and their families across the state by giving them more affordable health care. “The philosophical reasons and underpinning for this policy are solid,” he said, adding that legislators have extensive discussions on the topic in the weeks ahead. House Majority Leader Pat Sullivan, D-Covington, noted the state will be picking up the cost of 31,000 basic education employees in schools all over the state. The districts will only be responsible for the employees they add to the basic education model. But the Legislature is looking at proposals to give districts “a little more levy capacity” to cover those costs, Sullivan said. Leonard, the Mead assistant superintendent, said he supports good benefits for employees, but the benefits package is a mandate from the state with a different structure than his and many other districts had, with no money to pay for the difference. If the Legislature doesn’t increase the districts’ levy capacity, some will have to choose between a mixture of cutting programs their families want and reducing employees, he said. Having the state pick up the full cost of benefits for non-basic education employees seems like a long shot. “We’re still figuring out how to get the $900 million that’s the state’s responsibility,” said Ormsby, chairman of the House budget committee. The state’s four-year balanced budget law means the spending plan must account for as much as $1.6 billion through 2023 to cover the estimated cost of benefits for basic education employees. While the state has projections of some $4 billion in extra tax revenue for the next two years, inflation and growth in demand for programs is expected to take up most, if not all, of that, and there are calls to spend more on a range of programs from improving mental health systems to fighting homelessness, opioid addiction and carbon pollution. Some school district leaders have suggested the Legislature change the benefits package. Although negotiated by the governor’s office, the School Employee Benefit package is part of a contract that must be approved by the Legislature, which usually happens as part of the budget. But the Legislature can’t change the terms of the contract; it can only approve it as is, or reject it and send it back to another round of negotiations. With budget hearings ongoing and formal House and Senate spending plans not scheduled to be released until late March, Ormsby said “anything’s possible,” so he couldn’t completely rule out a rejection of the contract. But that’s never happened in the past with state employee contracts, which go through the same approve-as-is-or-reject process. The state could take some financial pressure off the districts by revising the prototypical model and classifying more staff positions as part of basic education, although that would be handled mainly by committees that set education policy, not the ones that draft a budget. “Whatever is going to be done is going to be a collective decision,” Ormsby said. The Senate Early Learning and K-12 Committee is considering three different proposals to change the current school levy rates, which are capped at the lesser of $1.50 for each $1,000 of assessed property value or an amount that provides $2,500 per student. One proposal by Chairwoman Lisa Wellman, D-Mercer Island, would allow the districts to choose the larger of those two limits. Another, from the Office of Financial Management, would cap the district levy at an amount tied to 28 percent of its basic education allocation, plus the federal money for mandated school programs. The third, from the Office of the Superintendent of Public Instruction, would have the districts choose between a levy that would generate the lesser of $3,500 per student or 22 percent of the state and federal money the district received the previous year. Subject to changes as they move through committees, the proposals are designed to address the districts’ overall problems, including expenses like special education, not strictly the employee benefit program costs, she said. The benefit program is a matter for the budget committees to handle, Wellman said in a recent interview. She’s trying to come up with a better system for more than one million students in the state’s public schools, and “the revenue stream that funds the system,” she said. Relying on property taxes is not sustainable, she contends. She’s also looking at improvements to special education, where graduation rates are low, with the caveat that “we will never put enough money into special education.” Instead, the state needs to focus on doing the most it can with the money it has.